Our trusted doctors of optometry and carefully selected network of advanced eye disease specialists are committed to your optimum vision and eye health. At Eye Care Associates of Michiana, we have booster seats, special eye charts, and fun ways to help our youngest patients relax and receive their care. Once children realize there are no shots or pain associated with an eye exam, they are usually fascinated by our equipment and actually enjoy coming to our offices. 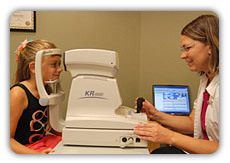 Children experience rapid changes to their bodies and vision while growing. We recommend a clinical assessment of your baby's eyes between ages 6 months to one year – especially if your child was born prematurely, has a lazy eye, crossed eyes, or there is a family history of eye disease or high eyeglass prescriptions. Once children reach the age of three, eye examinations should be conducted yearly. Professional eye care is an important part of a child's annual health care routine. During the first 12 years of life, 80 percent of all learning is through vision. Vision problems detected early are more responsive to treatment, and may help avoid the need for glasses or a strong vision prescription later on in life. Eye Care Associates of Michiana participates in InfantSEE®, a public service program that provides a one-time eye assessment for infants during their first year of life at no cost to families, regardless of ability to pay or access to insurance coverage. Dr. Robbins-Winters demonstrates an InfantSEE® eye exam for a news segment featured on WNDU-TV.